Keren Group - comprising Keren Industries and Keren Projects - is a leading engineering and construction company based in Beer Sheva in the Negev of southern Israel, in close proximity to the Ramat Hovav industrial area, the very center of the Israeli process industry. Keren Group provides specialized and comprehensive solutions, with the Keren seal of excellence to ensure the best results. Keren Industries is a heavy metal fabricator specializing in steel construction, vessel & tank fabrication, piping and equipment installation. 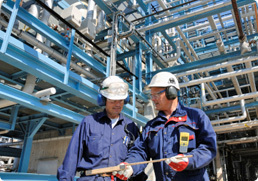 Keren Projects provides EPC and turnkey projects for the chemical and energy industries. Together, the Keren Group combines technical ingenuity with the highest quality industrial materials and a solid expertise that only comes with experience. and maintenance of project parameters, at all times guaranteeing quality, reliability and a superior outcome.